When the fishermen of Kandholhudhoo in Raa Atoll returned to their island on 26 December 2004, they were shocked to see a destruction that was difficult to describe. Debris from collapsed houses and destroyed buildings were scattered everywhere. They had not seen the deadly wave of destruction that hit the island in the morning. Most of those who witnessed the horror, those who frantically swam for their lives in the waters, had already left, in boats from other islands which had arrived for rescue. Clueless about what had hit their island, and the whereabouts of their family members, the fishermen set out in their boats, searching for loved ones. This was how life began for the people of Kandholhudhoo as internally displaced persons (IDPs), scattered in five different inhabited islands of Raa Atoll, living in temporary shelters. They would stay in makeshift tents for four years, till December 2008, when they were resettled in Dhuvaafaru, an uninhabited island, which was built from scratch by the International Federation of Red Cross and Red Crescent Societies (IFRC). In Kandholhudhoo houses were located within ten feet from the sea, and without the protection of the house reef, the island lay like a ticking bomb. Among the islands of Raa Atoll, only Kandholhudhoo, located on the western edge of the atoll, was badly hit by the Indian Ocean tsunami of December 2004. However, the island had suffered monsoon flooding and swells even prior to the tsunami. Kandholhudhoo was an extreme case of population congestion, with more than 3,000 people living in a tiny speck of land with only 150 meters in width and a land area of merely 4.4 hectares. Life in the island was inhospitable even back in 1990s. However, the people refused to settle elsewhere, because of the island’s proximity to good fishing grounds and various other socioeconomic factors. An economy based on traditional fishery and sea cucumber fishery thrived on the island. Young fishermen often scuba dived recklessly, surfacing too fast with sea cucumbers, impatient to go for another dive to pick more sea cucumbers from depths below. However, as the lure of a quick buck increased the cases of decompression sickness, life went on in Kandholhudhoo, and people continued to walk in the island’s narrow lanes – some barely enough for a person to walk, and some too narrow for a coffin to be carried – and new buildings sprouted from the income earned through fishery. The large population pressure had led to the reclamation of the coastal area of Kandholhudhoo in all directions beyond the local reef, making the island more vulnerable. The island became first vulnerable to monsoon floods and swells due to a combination of factors including a reclaimed shoreline and a mined reef. To find a temporary solution to the high population pressure on this island, the previous government gave in to the demands of the islanders by allowing the reclamation of the coastal area in all directions beyond the local reef, known as the “house reef”. Houses were located within ten feet from the sea, and without the protection of the house reef, the island lay like a ticking bomb. The occasional swells and flooding could have been warnings of an inevitable doom. Dhuvaafaru, literally meaning “running reef” in local language Dhivehi, was an uninhabited island in the eastern edge of Raa Atoll. In reality the reef is not moving but the island has got very dynamic beaches and the shape of the island changes frequently. While the reef remains in its original location, the shifting beaches and variations in the shape of the island during different seasons must have led to local fishermen to name the island as a moving reef. 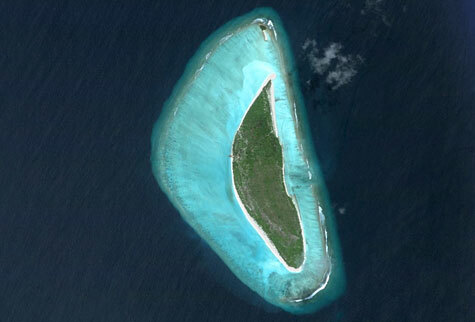 Dhuvaafaru as an uninhabited island in the eastern edge of Raa Atoll. Seasonal variations in the shape of beaches and shoreline are not a new phenomenon in the Maldives. In fact, in most islands of the Maldives, the forces of erosion and deposition, along with variations in ocean currents and wind, based on the Monsoon, causes the location of beaches to shift. The location of a large white sandy beach during northeast monsoon may turn into a lagoon in the southwest monsoon, while the beach is formed in another part of the island. In Dhuvaafaru, the forces of nature were at work more intensely, making the island very dynamic. Dhuvaafaru project has been the largest single post-tsunami reconstruction project in the Maldives and one of the biggest in the IFRC’s history by developing an island community on 49 hectares of low-lying uninhabited coral island in the Maldives. The IFRC has built 600 new houses and other amenities, using donations from the American, Finnish, and German Red Cross societies, and at a cost of 35.6 million Swiss francs. However, proper consultation was not made with the island community of Kandholhudhoo before the decision was made to resettle them in Dhuvaafaru. Officials of the former government had a minimal consultation with the island community while the people were traumatized by the tsunami. Moreover, proper studies were not made on the topography and geomorphology of the island before it was selected. 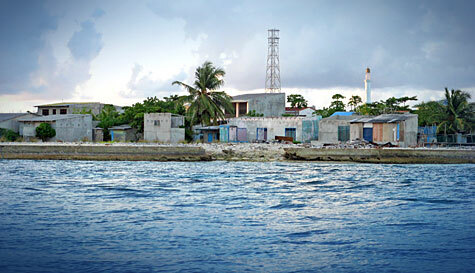 Dhuvaafaru is one of the lowest islands in Raa Atoll with a height of less than a meter. Moreover, not less than one third of a meter from the top soil of Dhuvaaafaru has been removed in leveling the land surface, further lowering the island’s height during the construction of infrastructure. 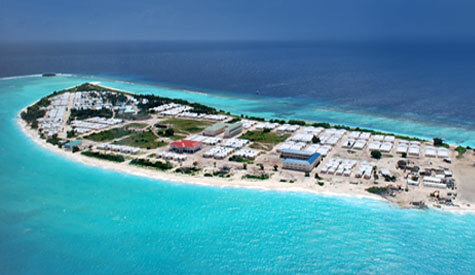 Dhuvaafaru is one of the lowest islands in Raa Atoll with a height of less than a meter above sea level. At the end of her official visit to Maldives (18-25 February 2009), the United Nations Human Rights Council’s Special Rapporteur on Adequate Housing, Ms. Raquel Rolnik, pointed out a number of concerns, such as allotment of resources by some international donors and their administration by the Maldivian authorities, which was not done as competent as it could have been. “In the new resettlement sites that I visited, I detected a lack of participation in the decision making process concerning relocation, the design of the new houses, and the infrastructure, which resulted in new structures that were not always compatible with the livelihood of the communities”. Dhuvaafaru is an example of the type of new resettlement where there was not sufficient community participation in the decision-making process. The traumatized people were in need of a new home, and they were willing to go anywhere. 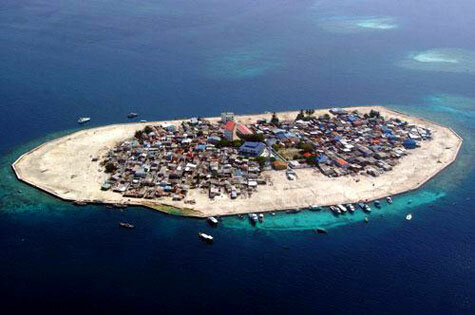 The government officials, by choosing Dhuvaafaru, made an impractical decision as Dhuvaafaru is a relatively small island and would not cater to an expanding population. The people of Kandholhudhoo, after suffering from population congestion and land scarcity, would encounter the same problems within a few decades in Dhuvaafaru. Some government officials and even a few islanders seemed to envision a solution in the pristine lagoon of Dhuvaafaru. They were hoping to reclaim the lagoon and find new land, even though such an expansion would make the island even more vulnerable. Land reclamation had been one of the favoured solutions of the previous government, whether it was to ease population congestion, for developing new resorts, or even for waste management. No lessons seem to have been learned from the example of Kandholhudhoo. The United Nations Intergovernmental Panel on Climate Change (IPCC) has recently projected in its latest report a rise of the sea level worldwide by two feet by 2100 as a result of melting ice sheets and the expansion of the sea by warming seawater. If the IPCC projection is accurate, Dhuvaafaru would be among the first islands to be affected by rising global sea level. 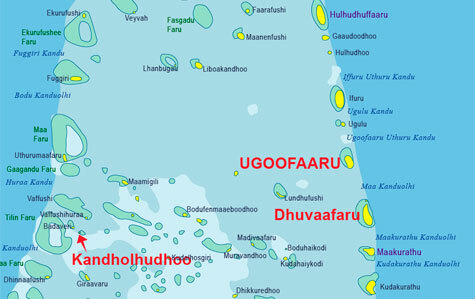 Dhuvaafaru is promoted as a ‘safer island’. 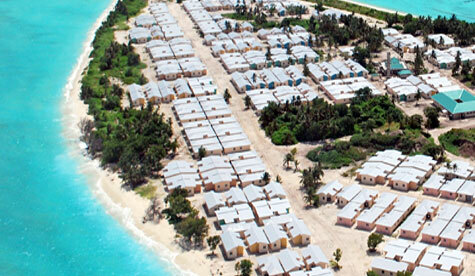 It is ironic that such a comparatively low island was selected to house tsunami refugees. There is historical evidence that people lived in Dhuvaafaru some 200 or 300 years ago. In the famous tale of Mohamed (Bodu) Thakurufaanu who saved the Maldives from Portuguese in 16th century, his compatriot Dhandehelu hails from Dhuvaafaru. Elderly people from Kandholhudhoo claim their ancestors lived in Dhuvaafaru. Some even say the tombstones of their forefathers had inscriptions with references tracing the origins of the family to Dhuvaafaru. Dhuvaafaru was abandoned by its last inhabitants due to erosion. The people of the Maldives had always lived at the mercy of the forces of wind, water, and salt. Erosion is not a new phenomenon. Historians and geographers, who had visited these islands centuries ago, had chronicled the migration of the island communities from one island to the other because severe erosion, abandoning islands and taking with them their belongings including even trees. This had been first documented by Arab geographers Abu Zayd of Siraf in 890 A.D. and Al Biruni in 1030 A.D. Hence, it is probable that the people living in Dhuvaafaru left the island and settled in Kandholhudhoo due to its proximity to rich fishing grounds. If that had been the case, history seems to be on a reversal, as the descendants of those people return to Dhuvaafaru, not because of erosion, but after being refugees of the tsunami triggered by a submarine earthquake off the coast of Sumatra in December 2004. It will be an irony of history, if the descendants of the current settlers are forced to abandon Dhuvaafaru, due to climate change, erosion and rising sea levels in the not too distant future.